What a busy couple of weeks! A change of job to work nearer home, ongoing preparations for the impending wedding for No.2 daughter, Open University assignments and of course the work needed in the garden. Finally I think I have managed to find time to update the blog with a few key pictures to show the progress made. 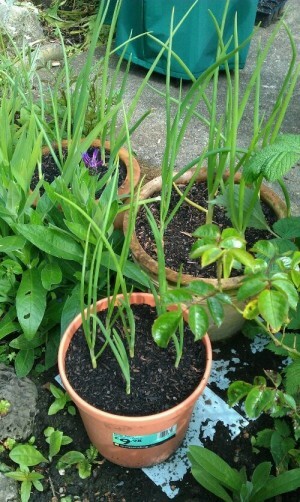 It was fast becoming clear that my plan to follow the potatoes with the runner beans was not going to work. Mainly down to my impatience and planting the beans a bit early. 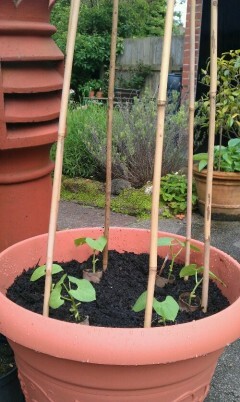 As a result I had some healthy looking runner bean seedlings desperate for planting out and nowhere to put them. A quick trip to the local pound shop soon solved this problem with a large tub so now i have the canes in place and the first batch of runner beans in. There is something of a common theme developing as time goes on now with a distinct lack of space for the many big ideas – hardly surprising though given the name of my blog! This means that I have assorted veg plants all over the place and a very good example of this are the onions in a range of spare pots that I have managed to sneak in among the flower borders. I have previously avoided plants in pots because they are higher maintenance with care and watering but this time there wasn’t much choice with the amount of plants I wanted to get in the ground. 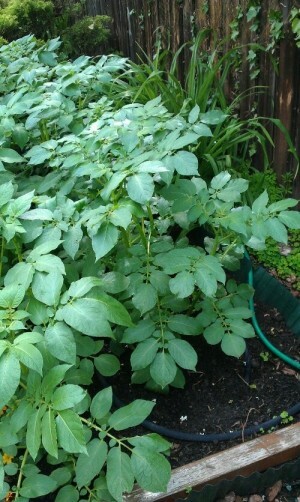 I am most proud of my potatoes though and to my untrained eye they look as if they are doing really well. I noted on a comment made on Gardeners World this week that watering is not needed until the flowers appear but with our recent damp weather that hasn’t been a concern. 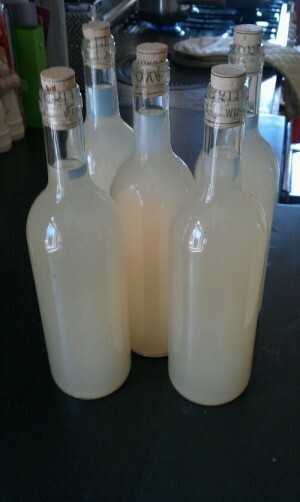 And finally the ginger wine has now been bottled. Obviously it needed a quick taste beforehand just to check the quality and it’s a mean brew with quite a kick on it! I’ve got no idea if its supposed to be cloudy like this but im just impressed that something vaguely drinkable came out of all my efforts. Not a bad result after 3 weeks of fairly low-key effort on my part but then I haven’t tried more than a couple of sips. I’m a little worried that this may have the potential to take paint off the woodwork and disinfect the kitchen floor.